There is one thing in this image of an U.S. Army Corps of Engineers Park Ranger I made recently that is very uncommon today. Do you see it? Yes, the pipe. I remember when I entered the Army in 1963 (yes, Army Corps of Engineers) and I’d say just about 100% of us smoked, not chewed, tobacco of some sort. Most used cigarettes, but there were many who chose a cigar or pipe. I smoked cigarettes but experimented from time to time with a pipe. I recall one such time when I overdid it with the pipe, by smoking bowl after bowl of tobacco because I never could keep the darn thing to stay lit. As a result, I burned the tip of my tongue…so much so that I never put a pipe near my mouth again. I did the same thing with cigarettes in the mid-1970s. 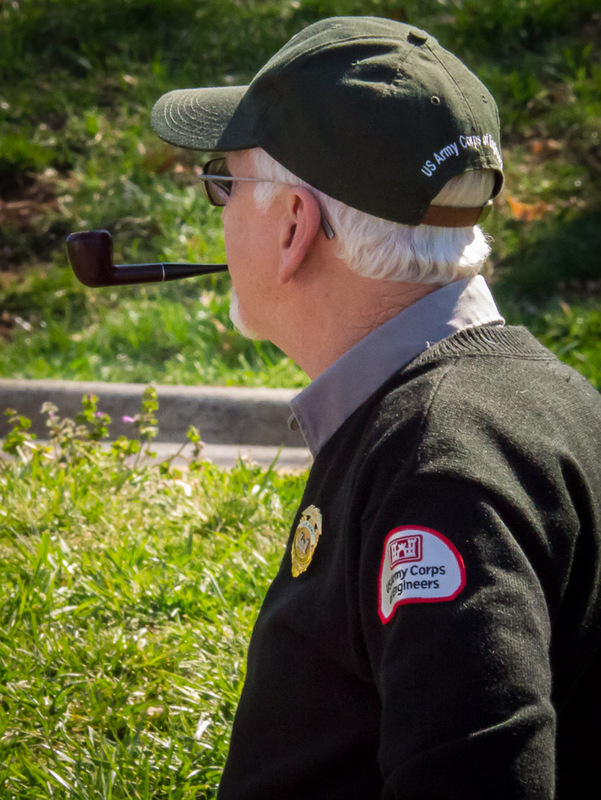 Regardless of the clearly obvious health hazards of tobacco use, there is something nostalgic about seeing someone smoking a pipe. It looks so relaxing, and like this park ranger taking a break from his work activities, seems to convey being a peace with himself and the world. As an aside, I made this image at Martinsville Speedway during race weekend April 5th. The park ranger was there along with others who had set up a display promoting usage of the local Corps of Engineers recreational facility at Philpott Lake Dam and Reservoir near Bassett, Virginia. Wonderful place to visit. I did the chewing tobacco, then got married and start a pipe. Many years, never did the cigarettes. On occasion I still enjoy good cigar especially when flyfishing.